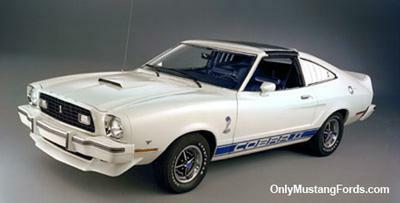 I had 3 Mustang Cobras 2s at 1 time. All cars were 76`s. One Mustang was a V8 automatic, switched to a 4spd and a 351 Windsor V8 (a 351 Cleveland will fit with the right exhaust manifolds). The second was a rusty v6 parts car and the third came with a factory 4cylinder engine. All were Cobra 2s. Loved those cars,but time went on and I sold them to a couple of people. Its great that people like you are keeping the Mustang 11 memories alive. Hopefully the people that you sold the cars to have kept working on them and restored them to their original condition or made some cool weekend racers. If you have any pictures of the cars and the engine swap you did on the v8 car, I will be happy to add it to this page. The more Mustang shows I go to, I seem to see more and more of these cars restored (with engine mods) and they seem to be starting to become more prominent than the 1971-1973 cars.